I lived in the U.S. until 1989. My last job there was as director if the Hillel House at U.C. Santa Cruz. The summer of 1989 I made aliya and have lived since then on Kibbutz Matzuba in the northwest corner of Israel, 3 km from the Lebanon border. Since moving here I have lived through 3 wars, experienced katyusha rocket shelling and a terrorist attack on our home and- ever the optimist- still dream of a lasting peace. I work as a social worker with independent seniors in residential living situations and really love my work. For fun and recreation I perform with a group of 15 singers in the closest city, Nahariyya, where we perform to a full house in the local auditorium (about 600 seats) 5 times a season, singing modern and traditional Israeli folk music. What can I say...You all know that I was a high school addict & loved being involved in everything, from drill team and varsity cheer to Madrigals and Key Club sweetheart, my high school experience was amazing and overwhelmingly positive. I guess my one disappointment was what we left behind as our plaque in the senior quad- "Out the door- '74"
come on guys, we were much more than that, were'nt we? Beth Safian has a birthday today. Beth Safian has a birthday today. New comment added. Beth Safian posted a message. New comment added. Beth Safian added a comment on Profile. 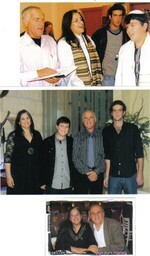 here are some recent pictures- 2 from my son Daniel's Bar Mitzvah, showing my partner Nachum, stepson Dolev, son Daniel & me; the third photo is from a recent wedding, with a friend, Amnon.